Ready to tone up for summer from the comfort of your home? You're invited to join the Fit Armadillo Drop 2 Sizes Fitness Challenge or steal the tips and try it out on your own. 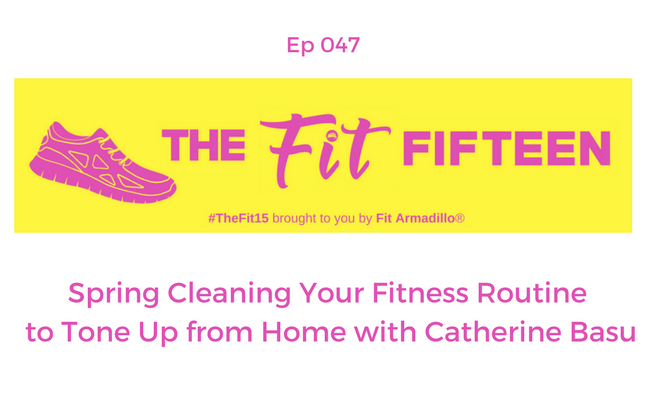 Today's episode reviews some tips that will help you set up your home gym space and detox...your schedule...(please don't try a detox - your body does a great job of this on its own - REALLY!). Learn how to make your routine more efficient and effective with some basic fitness program design tips and home gym equipment ideas. You can get results at home in 10 weeks or less so don't forget to take action and keep us updated on your fitness journey this spring. Shawn Achor's book The Happiness Advantage is where you can learn more about the 20-Sec Rule, but ALL of his books are awesome. Have a question? Email me: Catherine (at) FitArmadillo.com before signing up.